What is the ideal length of a training program to ride a century? The ideal length of prep for a century, if you're starting from zero, is about 12 weeks. In that time, you have time to build a decent base, add some intensity, and spend some time in the saddle - all things you need to complete a century. What if I don’t have 12 weeks? If you are already in good shape, you can skip the base building and do it in 8 weeks. VeloPro allows you to do this and adapts to your schedule. What if I’m a procrastinator? Can I do it in even less time? Honestly, it depends on the athlete. Jumping right into intense training can result in injury. Also, the lack of rest and recovery time can wear you out before your event. The goal is to arrive to your event in peak condition so you can be confident and enjoy the ride. Trying to cram a ton of training a week or two before the event doesn’t work well and guarantees needless suffering. I am confused about pacing and how VeloPro training prepares you for an endurance event like a century. For racing it seems obvious. When I raced the goal was to go as hard as possible for as long as possible. My result at my event was an hour performing at and often far above the Lactate Threshold Zone. I set personal bests and killed it with VeloPro training! However, for a century ride how should I pace myself? Should I target some sort of average MPH? For events like Centuries, it is tricky to set speed targets because, as you know, there are a lot of factors that can affect speed—wind, hills and not the least of which, treat stops! It's best to target an Endurance or Tempo pace for your level of fitness and experience. 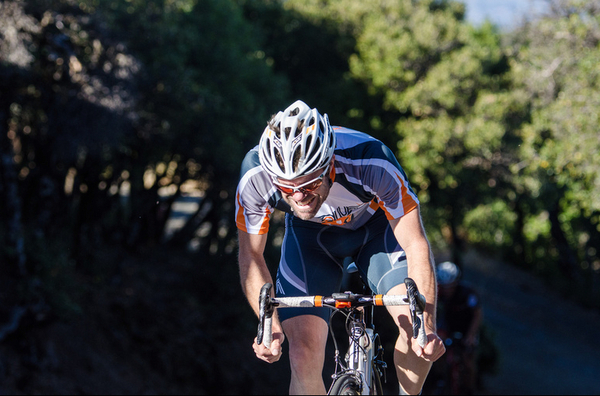 Start slow and be careful to avoid the giant adrenaline burn that commonly pops up for new riders when they are anxious or excited at the beginning of an event. You will need this energy later. When training 1 to 2 hours, most of the time I find myself riding in the Tempo Zone and Sweet Spot Zones. I can’t imagine doing this for 5+ hours. Any thoughts on how short training rides prepare you for a long ride? Any work a rider does in the higher intensity training zones also trains their ability to work in the lower ones. So, riding at Lactate Threshold helps your Endurance. The problem is that higher intensity rides require more recovery time, so it has a higher training "cost." So, we try to balance foundation work (L2/L3) with intensity (Sweet Spot Training/L4+). So, one may ask: Why do any intensity at all if the event is all L2/L3? That's because 1, Intensity gives better training "bang for buck" and 2, nearly any ride in rolling or windy terrain will require some intensity. Training the rider to be able to recover from shorter efforts is valuable in this regard. L2 and L3, while not easy, are not "intensity" as such. They train a different part of our aerobic engine. L4 runs the aerobic engine at high cruising speed - just enough to go fast, but not completely drain the fuel tank. The higher levels are redlining it. So, to answer this: "Why do any intensity at all if the event is all L2/L3?" If you have all the time in the world and your event has zero geographical obstacles (hills) and zero wind (northern Thailand, the Moon? 😊), then there isn't a lot of reason to train in any other zones. However, there are virtually no times at which those three circumstances exist together. So, intervals prepare you for short pushes up steep climbs, intensity of pushing into the wind, and variations in pace. More importantly, though, intervals are an efficient way to train intensity and to train recovery. If your legs are used to doing 7 or 8 all-out 2-min efforts, then they will be able to recover well between those efforts in your event. VP doesn’t actively put long training rides on the calendar when training for a century. If you aren’t used to spending many hours in the saddle, are you unprepared? Planned 20, 40, 60, 80-mile rides in prep for a century seems logical. Almost like FTP tests. I did ride 96 miles in training last week, but this was over 5 different rides. Am I missing something? VeloPro does put long rides on the calendar IF the user puts enough hours/day of availability for that to happen. The general rule for century prep is that, if you can ride 100 miles in a week, you can do it in a day. That's less physiology and more old school wisdom. Yes, it is ideal to spend more time on the bike (at a time) so that you're comfortable riding for the length of the ride, but it's not always possible for people and when they input their schedules, we must work with those. VeloPro currently biases long rides towards weekends. We do have a feature we are working on that will allow users to choose their long day or days. We hope to have this done soon. Giving the user more control is good, but we want to make sure that it stays simple, easy to use and doesn’t violate good training principles.